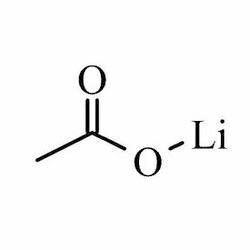 Lithium acetate is an inorganic chemical compound and salt of lithium and acetic acid. Our product range is known for its low electrical conductivity. Lithium acetate is extensively used in different textile industries. Furthermore, it is also used as polymerization catalyst, raw material for pharmaceuticals, preparation of antistatic fibers and stabilization of polyvinyl chloride. Lithium acetylide is an inorganic salt which has molecular formula c4h9lin2. Lithium acetylide is used for the synthesis of substituted acetylenes by reaction with organic halides or with ketons. Our product range is known for its accurate ph value and precise composition. Lithium acetylide is available with us in different technical grades.